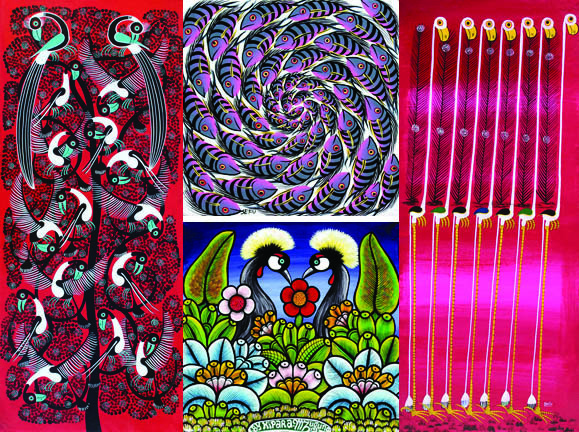 We are the largest online distributor of authentic Tinga Tinga art in the United States. Tinga Tinga is visual art style originating in Tanzania, East Africa. It was started by a single artist in 1968 named Edward Tingatinga who was born near the town Tunduru in south Tanzania sometimes between 1932 and 1936. Today, most of the artists who continue to paint in Tinga Tinga style are distant relatives to Edward Tingatinga. Tinga Tinga art became world known and in 2008 Walt Disney and BBC launched animated series called Tinga Tinga Tales which were illustrated by the same artists. There is no perspective, monotonous colors are applied and enamel paints are used. Each selection is drawn over a stretched canvas covering a wooden frame. Probably the art has its roots in the wall painting tradition which was observed in central and south Tanzania. Most people love their Tinga Tinga paintings and never would sell them. But some people also look at Tinga Tinga paintings as an investment. We believe the prices of the Tinga Tinga paintings are undervalued. We have not yet started to appreciate this art form. We have not yet understood the hidden symbols, the message and the life of the artists. Our premium paintings are all signed by the artist and come with the "Tinga Tinga Original" rubber stamp on the back. Step 1: Place your order. You will not be automatically charged. Step 3: If in supply (95% of the time) you will then be charged. Your order will ship out immediately via DHL. Shipping to the USA usually takes 1 week. If the painting is not in supply the order will take 2 weeks to reach you if you agree to wait. If you agree you will be charged at that point.